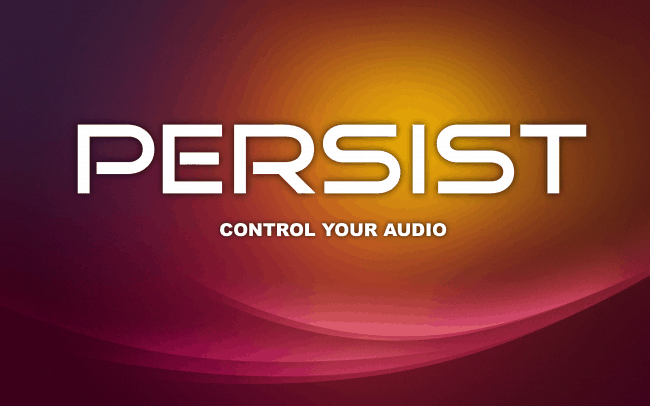 Description: Persist+ is a new volume control app for Android that aims to be the most powerful available. Far more than just another app to control the different volumes on your device, Persist+ allows you to individually control different types of volumes at different times of the day, depending on location and more. Perfect for those times when you’re in a meeting and you need to quickly – and completely – silence your smartphone, as well as times when you need to be alerted of just phone calls and nothing else. Persist+ allows for total control over your volume and features an emphasis on ease of use, with quick-access toggles in your notification area and a bevy of widgets on offer, Persist+ is quick and effective no matter where you are. How it Works: Persist+ is available for download from the Play Store, as a full version, as well as 24-hour trial version to see if it works well on your device. Once you download and launch Persist+, you’ll be given a look at all of the different levels on your device. These can be changed how you like, but this is just the beginning. The real features of Persist+ however, are found in the list of profiles which you can access by hitting the list-looking icon in the top-right corner. There are some defaults already included in the app for you, giving you an idea of how to use the app. You can make whatever adjustments you like – including the name – of all the presets, as well as add your own, giving you limitless configuration possibilities. 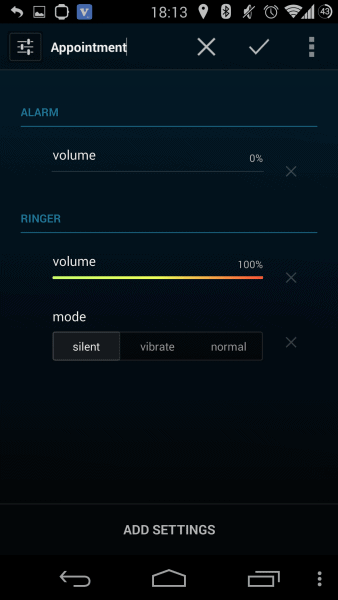 With the above configuration, my ringer (for phone calls) is set to maximum, so I’ll definitely be alerted of phone calls, but anything else gets filtered out. 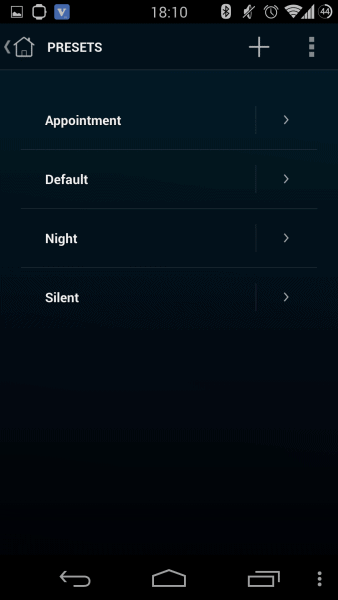 You can add more filters to better control the audio on your device, too. Who could forget the widgets? With a boat load of widgets included with Persist+, you can easily change things whenever you want from your homescreen. Opinion: Persist+ is a godsend for those that bounce from meeting-to-meeting and for those that just want to be able to knuckle down and get some studying done for an hour or two can do without being disturbed. Persist+ is incredibly robust and flexible, with the ability to change pretty much everything to create your own carefully crafted sound profile, making sure you never miss a phone call, or keep emails coming in all day at work, but drown out everything else. Persist+ is also a slick app with lots of features and a look that will fit in with any Android smartphone on shelves today. East to setup, but as granular as you like Persist+ will appeal to a whole bunch of people. Speed (4/5) – With nothing to complain about here, Persist+ manages to offer a myriad features without ever slowing down under the weight. Features (5/5) – Far more than your standard volume control, Persist+ allows for near infinite control of what your phone does when you’re not looking. Giving you the confidence to go about your day without embarrassing ringtones or blurts of sound from your pocket or bag. Theme (4/5) – Persist+ is a good-looking app that works great on pretty much any smartphone running Android today. 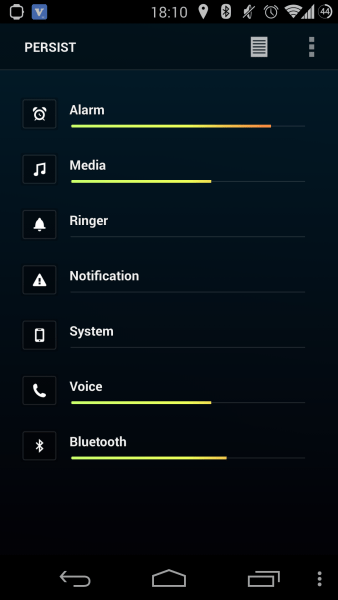 Overall (4.5/5) – Thanks to the range of configurations and customization options on offer here, Persist+ is a great app to take back control of your smartphone’s volume and is great for those always on the go. Easy to get to grips with, Persist+ becomes only as complicated as you make it. Simple sliders and widgets make it easy to adjust things on the go. Preset profiles are infinitely configurable allowing you granular control over everything you want to happen on your device. Good-looking theme is easy on the eyes and simple to follow-along, making things even more hassle-free. A tutorial would be good for those a little less tech savvy than the majority of users. Some users might find things a little confusing without any guidance. Conclusion: It’s clear that a certain type of user will benefit from Persist+ more than others, and really only those that are bouncing from meeting-to-meeting will get the most out of this and that’s fine, those with a hectic lifestyle don’t want the added stress of a smartphone speaker running the show. Students, busy business partners and those in professional working environments will absolutely love this, but so too will users just looking for a way to put an end to noisy and unpredictable smartphone noises. The post Sponsored App Review: Persist + (Volume Control) appeared first on AndroidHeadlines.com |.